I finished one book this month (top left) and started another (bottom left) during Thankfully Reading Weekend. My wife and I also said goodbye to one car and hello to another. We also celebrated Thanksgiving. I only had one thing planned for November: a long Thanksgiving weekend, during which I wanted to read for the event Thankfully Reading Weekend. I did that, and my wife and I got a new car! Our old one was dying, and it was time so we got a 2011 Subaru Outback, which we are loving so far. 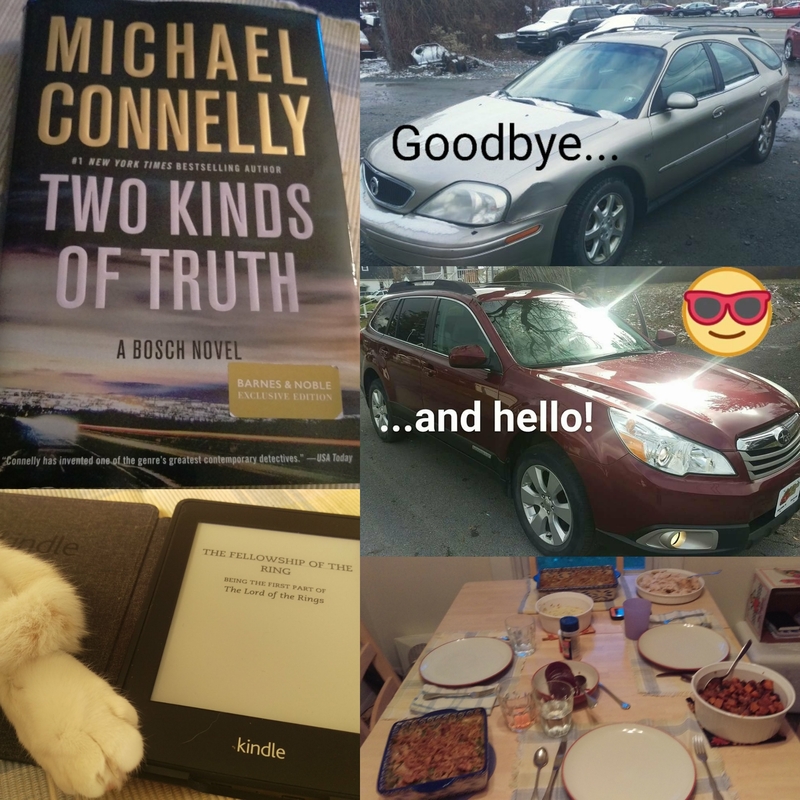 Reading-wise, I finished Two Kinds of Truth by Michael Connelly and started the first book in The Lord of the Rings, a reread, for Thankfully Reading Weekend. The latest in the Bosch series was another good one, and I’m looking forward to digging into The Fellowship of the Ring more in December. Also this coming month, I’m looking forward to us going to see my parents for Christmas (the weekend before since Kim works Christmas Day) now that we finally have a reliable car. They live about 60 miles away, and it will be good to see them, my aunt who lives with them, and my sister and her family who will come over that Sunday. So how was your November? Read, watch, or listen to anything good last month? How does your December look? Previous Post 2017 Thankfully Reading Weekend — I’m out! Did you watch Mindhunter on Netflix yet? I thought of you while watching it, as I think it is a series you would enjoy. I caught the last 30 minutes of The Return of the King on TV over Thanksgiving weekend, and now I am in the mood to revisit the series. I know I have no business re-reading them with my backlog of review copies, but I don’t necessarily want to watch the movies no matter how fabulous they are. I will think of something. Enjoy your re-read! I’m hoping to make my van last another year, but I’m not sure if it’ll make it that long. When I have to replace it, I’m definitely looking for a Subaru Outback or similar kind of car. I’ve heard lots of good things.